After the overwhelming defeats which the Turkish armies had suffered in Mesopotamia and Palestine in the fall of 1918, it became clear that the hour for surrender had struck for Turkey. As soon as the Turkish authorities had decided that their cause was lost, they sent General Townshend, of Kut-el-Amara, who since the British debacle on the Tigris in 1916 had been their prisoner, to inform the British admiral in command in the Aegean Sea that they desired to open immediately negotiations for an armistice. Vice Admiral Calthorp, the British commander, replied that, if Turkey sent fully accredited plenipotentiaries, they would be informed of the conditions which the Allies had decided to impose upon Turkey before hostilities could cease. The Turkish plenipotentiaries arrived at Mudros, on the island of Lemnos, in the Ægean Sea, on 27 October 1918. Three days were consumed in parleys, at the end of which the armistice was signed in the evening of 30 October 1918. 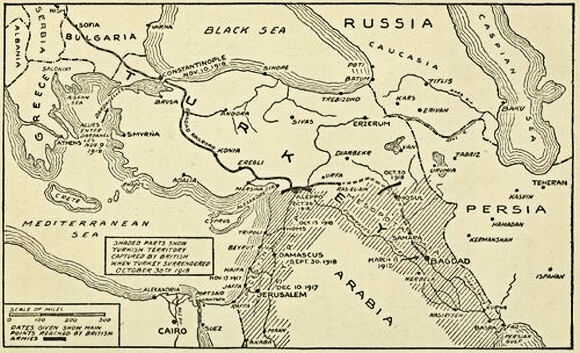 It was to take effect at noon of the next day and involved, among others, the following terms: the opening of the Dardanelles and the Bosporus, with Allied occupation of the Dardanelles and the Bosporus forts; immediate demobilization of the Turkish Army; surrender of war vessels in Turkish waters; right of the Allies to occupy strategic points; withdrawal of Turkish troops from Persia; surrender of garrisons in Hedjaz, Syria, Mesopotamia, etc., to the nearest Allied commander; Turkey to cease all relations with the Central Powers.